Original test chart that I found online. I recently received my October 2016 issue of Road & Track magazine and, being a Porsche fan for quite a while, was thrilled to see that this issue was heavily devoted to the brand. However, even better than the articles themselves was the “Road Test Summary” that was included near the back of the issue and had all of R&T’s test data for the Porsches that they’ve tested over the years starting with a 356-4 from 11/1952 and concluding with a Turbo S from 10/2016. It was great to see just how much price, power, and performance figures have changed over time! That said, I was a bit surprised when I came to the Carrera GT test from 6/2004 and saw its weight listed as “3,530” pounds. Being decently familiar with Carrera GTs, this figure just didn’t make sense to me, as Porsche put so much time and effort into reducing weight on the car. So, seeing as how I don’t currently own a CGT and therefore couldn’t go weigh it, I took to the internet to find more data. It wasn’t long before I found this terrific article that I had almost completely forgotten about involving a test of a Carrera GT, Ferrari Enzo, and Ford GT that Motor Trend conducted in December of 2004. Unfortunately, this is the only magazine article that I could find involving a definite U.S. spec CGT, as the other ones only seem to be from the initial press drives in Germany. In addition to the magazine article, I was also about to find a post on Ferrari Chat where a CGT owner had weighed his vehicle and posted his results. 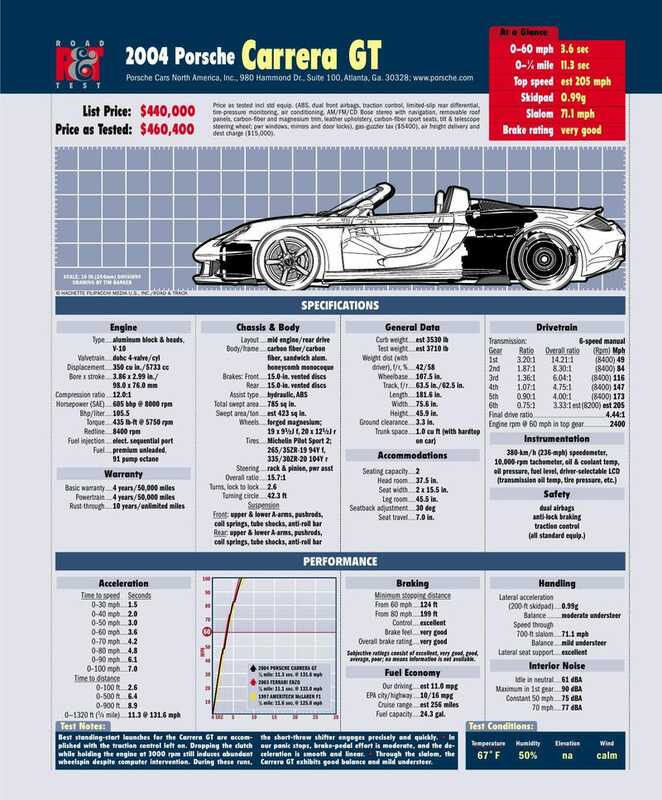 Seeing as how the numbers from the owner and Motor Trend were within one pound of each other (3,259 and 3,258 respectively), I was even more confused as to how Road & Track’s number didn’t just seem to be wrong (I could understand the weight being within 50 pounds or so) but significantly different than those two sources. So, I went back to the R&T’s chart and that’s when I saw it, a tiny number one at the top right corner of the weight figure. After consulting the legend at the bottom of the page, the answer became obvious- the tiny one denoted “estimated.” Luckily, the actual performance figures were verified test data so I’ve included those below. In addition, while researching the CGT weight conundrum, I became curious as to how well these pinnacles of performance match up to their modern day counterparts. As you can see below, progress has most definitely been made in the form of test numbers. Note- In case anyone is wondering, I have included the Ferrari Enzo’s numbers because the vehicle was a customer’s car, not a company one. By the same token, I have not included the LaFerrari’s numbers because all of the tests I could find were conducted at Ferrari’s test track, in a company car, under the supervision of Ferrari personal. Keeping this in mind, I can’t be certain if a customer car would perform the same.